Pictured, from left, are Nolan Dailey, Bently Truman, Gavin Devanathan and Cole Cline. 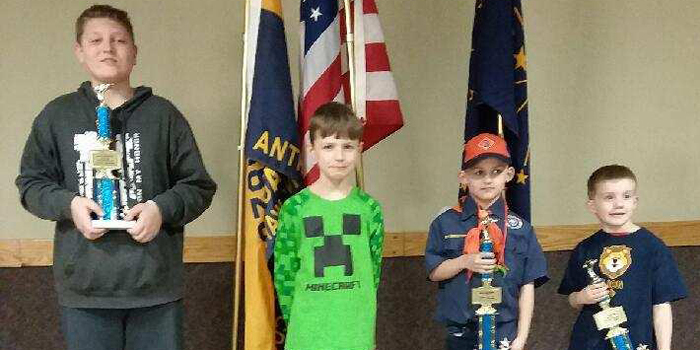 SYRACUSE — Four members of the Syracuse Cub Scout Pack #3828 brought home trophies from the Lincolnway District Pine Wood Derby that was held in Warsaw on Friday, March 15. Nolan Dailey placed second in the Webelos Division with a time of 3.478 seconds. Bently Truman placed second in the Bears Division with a time of 3.4912 seconds. Gavin Devanathan placed first in the Tigers Division with a time of 3.466 seconds. Cole Cline placed third in the Lions Division with a time of 3.662 seconds.